Don’t you love it when after a nice warm shower you crush into bed, pull the duvet up and skink into sweet sleep? Sleeping is more of a necessity, but it carries a certain amount of pleasure as well. That pleasure can be even more significant when you slide under soft, luxurious and beautiful bed sheets! We often neglect the importance of having high-quality bed sheets. There always seem to be other more important things. 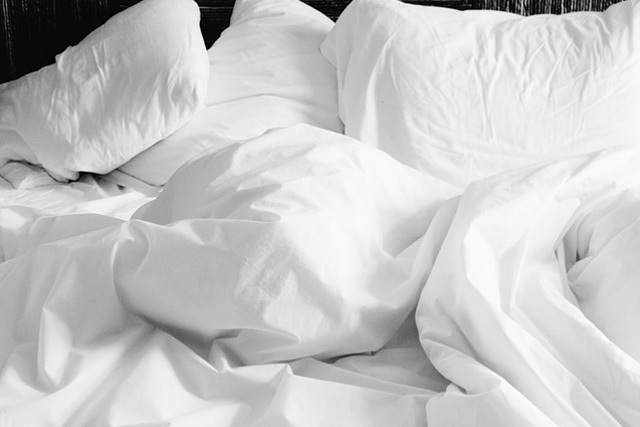 If you want to improve your sleeping pleasure yet, you are still sleeping on those old, plain white and worn out bed sheets, and it is time for a change. New bed sheets are not only for comfortable sleep, but it also gives a better look to your bedroom. Betting new luxury bedding doesn’t cost a fortune – but it can make you feel like a million dollars! If you decided that it is shopping time, here are some of the best fabrics to be on the lookout. Mulberry silk is the Rolls Royce of all fabrics. It has been around for thousands of years and it still holds onto its premium status. This fabric is not synthetic, which is why the prices for mulberry bedding sets are quite high. You can imagine paying a minimum of $300 for a decent set. Still, luxury comes at a price and mulberry silk can provide you with it if that’s what you are after. However, the fabric is long-lasting so that you can think of it as good value for money. Many celebrities have already confirmed that silk is their preferred material to sweet sleep. Since silk is a non-absorbing material, meaning that those night creams will stay on your face the entire night and work their magic. The texture of silk also helps to smooth wrinkles out. If that wasn’t enough, sleeping on silk pillowcase is right for your hair as well since the fabric’s proteins keep the hair moisturized. Bottom line – they are amazing to sleep. These are lightweight and gentle to the touch, letting your body breathe and naturally regulate its temperature. One thing to keep in mind before purchasing mulberry silk bedding is that you can throw it in the washing machine. Silk is a delicate fabric, and it requires hand washing or dry cleaning. Polyester satin sheets are the less expensive version of the mulberry silk sheets. It has similar properties to mulberry silk, yet it is a synthetic fabric, so it naturally doesn’t carry all the benefits as its superstar opponent. The best thing about polyester satin sheets is that they are durable and easy to take care of. It can wash in the washing machine on a low temperature, and you can even tumble dry them. They have a silky texture that is somewhat wrinkle-resistant, so you don’t have to worry about ironing too much. If you would like to have that silky feeling on your skin while still keeping things budget-friendly, polyester satin might be the right option for you. Linen is another premium organic fabric that makes a good candidate for bed sheets. It have excellent properties, such as bacterial resistance, ventilation, moisture absorbing and evaporation. No wonder it is recommended for people who suffer from skin diseases and allergies since it has anti-allergic properties! If you are environmentally conscientious you need to know this – linen comes from flax seed, so linen beddings are renewable and biodegradable. Linen bed sheets are a pleasure to get sweet sleep on since they can absorb moisture up to 20% of the weight, keeping you fresh while you sleep even on the hottest days of the summer! Linen is quite a durable material so you can expect your sheets to last you a long while. The only downside is that this fabric is prone to wrinkles but in all fairness – it still looks good! The more you wash linen, the softer it becomes, and yes, you can clean it in the washing machine! Not all cotton is made equal. There are cheap 100% cotton sheets that are not the most luxurious things out there, and then there’s Egyptian cotton. Egyptian cotton is the best form that cotton comes in – it is soft and comfortable while still giving you that feeling of lavishness. However, even Egyptian cotton has its subcategories based on the thread count. To simplify matters – thread counts under 600 are considered lower-quality types, while the ones over 600 thread count fall into the more expensive category. If you spot an Egyptian cotton bedding with 1500 thread count, then you have found the kind of the Egyptian cotton, or dare we say the Pharaoh! Egyptian cotton sheets are considered premium items and they do come at a price. Still, they are quite durable – the higher the thread count, the more pulling resistant they are. Pure Egyptian cotton sheets will cost you roughly the same price as mulberry silk. The important difference is that Egyptian cotton bedding is more comfortable to take care and it can last even for a decade. One important thing to keep in mind when considering to buy any cotton sheets, not only ones that are made out of Egyptian cotton – read the labels. If it says that the sheets are water resistant or wrinkle proof, then it is not organic cotton. It instead contains chemicals. Natural cotton wrinkles and absorbs water, so make sure you are not misled into buying something that you are not after. High-quality sweet sleep is essential so you can wake up happy every morning and ready to face the challenges. We know you might be thinking that your bed sheets can’t make a lot of a difference. But believe us when we say – they can. Sliding in bed under a lightweight fabric that will give your body a treat is something that everyone should opt-in. So if you need new bed sheets, choose a premium fabric. Soon you will understand what we are talking about.